So, this week is one of the worst of the year. It is the week of Samuel's finals. Therefore, I have had to relinquish one of my favorite hobbies for the week: distracting Samuel from studying. The main reason for me giving it up is not, as you may think, my supportiveness of my husband to work hard at everything he does, but rather because he is so dang motivated that he refuses to be distracted. Today he declared he was was going to the library all day to study. He thought it was that easy to escape. After I ran a few errands, I booked it to the library (get it????) and sat down next to him to write this post. "Hey, look at this picture!" I said, turning my computer towards him. "I can't. I have to study." "Come on, it's a before and after picture of some lady on Facebook who lost 300 pounds." 30 seconds later... "Hey do you have any food?" "Aw, look at this picture of your adorable nephew!" When that doesn't work... nothing will. When I finally realized that I was distracting myself more than I was distracting him, I packed up and headed for home, and here I am. 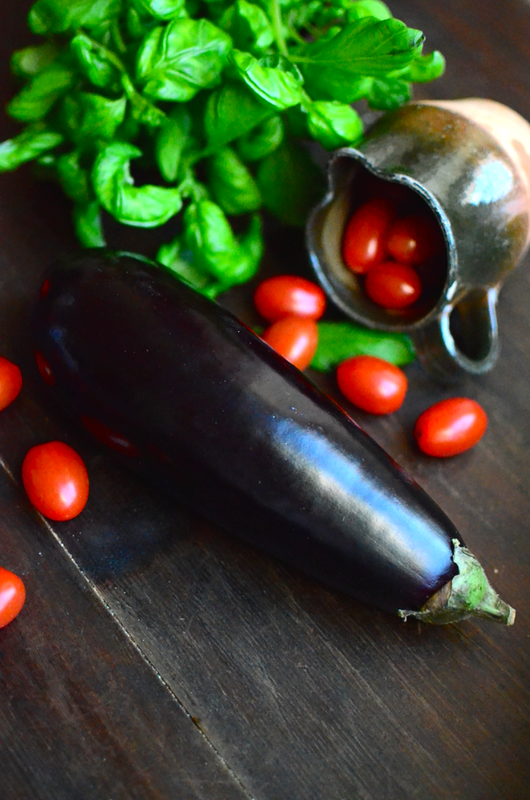 Anyway, let's talk about eggplant. 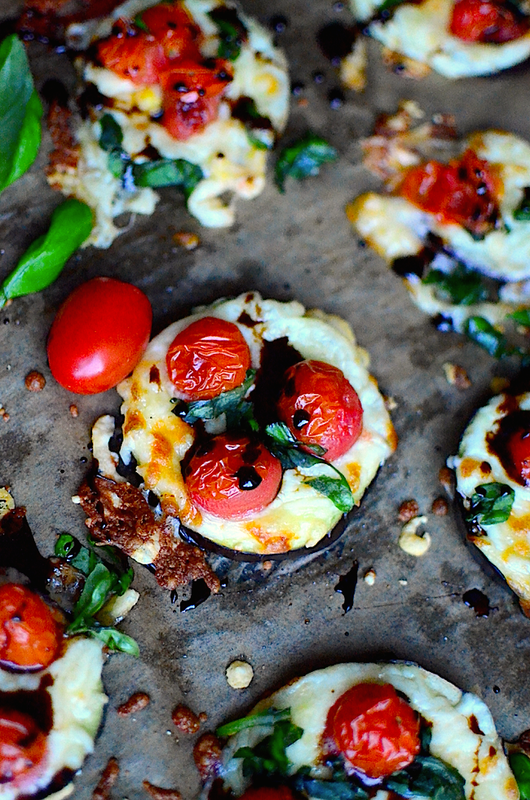 I didn't really ever remember having eggplant before I made these. Maybe I was afraid. I had only heard of rumors of rumors of eggplant. I had a vague idea that it might be weird or yucky. I passed it in the grocery store every day. It's shiny purpleness was mesmerizing. It never failed to catch my eye. My curiosity grew and grew. Finally, one day, I bought it. 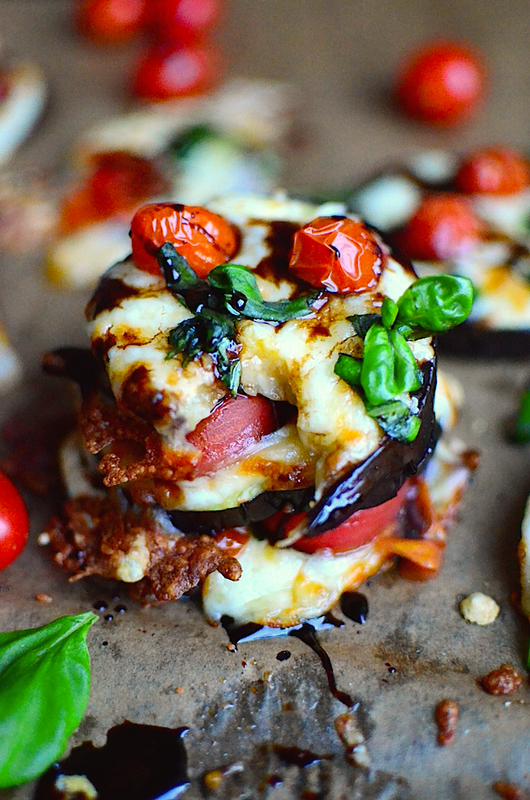 Eggplant is not as scary as you might think. In fact, it's not scary at all. Especially if you load it up with gooey cheese, bursty roasted tomatoes, fresh basil, and a little balsamic vinegar reduction. 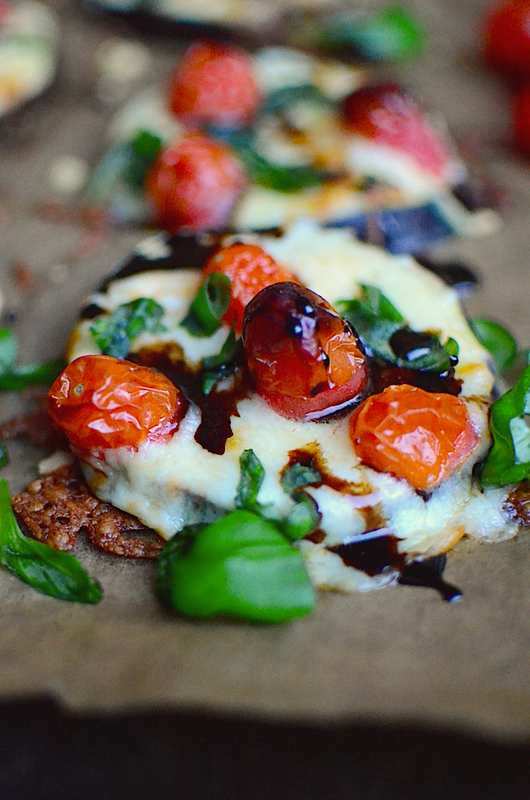 Seriously, if you've never made a balsamic reduction, stop everything now. It's so easy. It only has one ingredient (hint: it's balsamic vinegar) and I might have even cheated and made it in the microwave. It's wonderful. 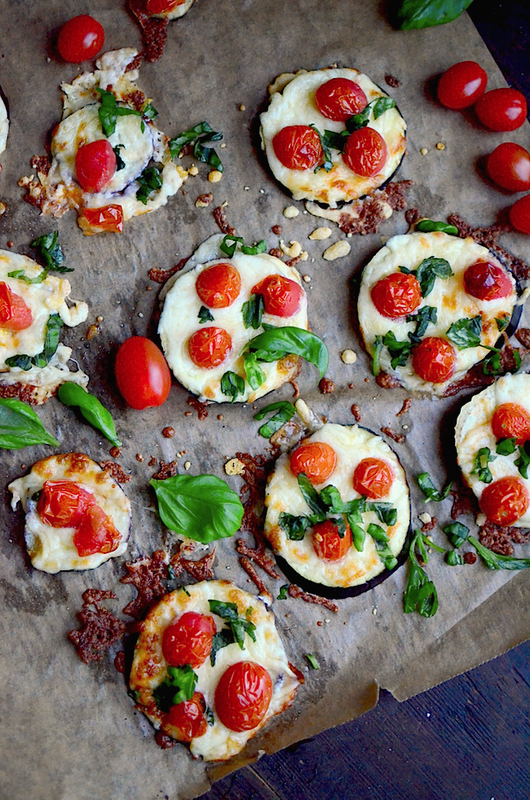 You could also try this with zucchini instead of of eggplant or even just a crusty slice of bread. 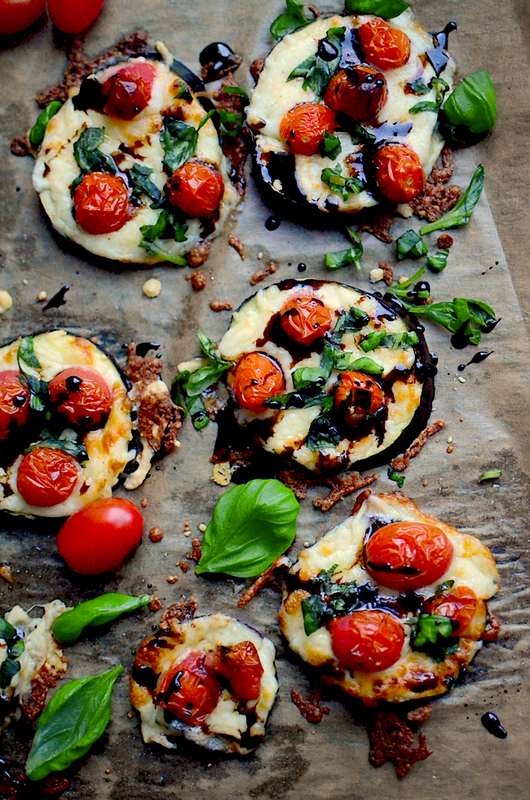 Or put the eggplant slices on some crusty bread to eat them? By the way, they're not as easy to handle as a piece of pizza to be honest, so may want a fork or two. Enjoy! Preheat oven to 450ºF (232ºC). 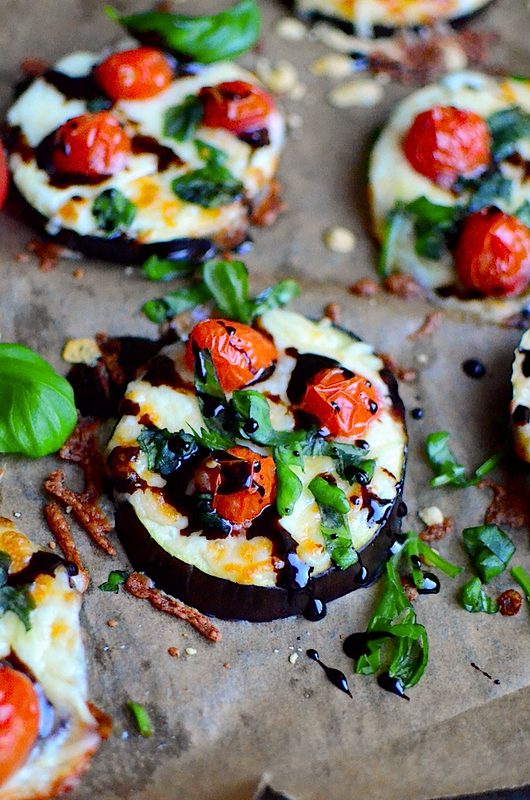 Slice the eggplant into round slices and place on a piece of parchment on a baking sheet. Top each slice with cheese and halved tomatoes. Bake for about 15 minutes or until the cheese is browned. Meanwhile simmer the vinegar on the stove for about 10 minutes or until thick. I cheated and did it in the microwave (it took less than ten minutes). 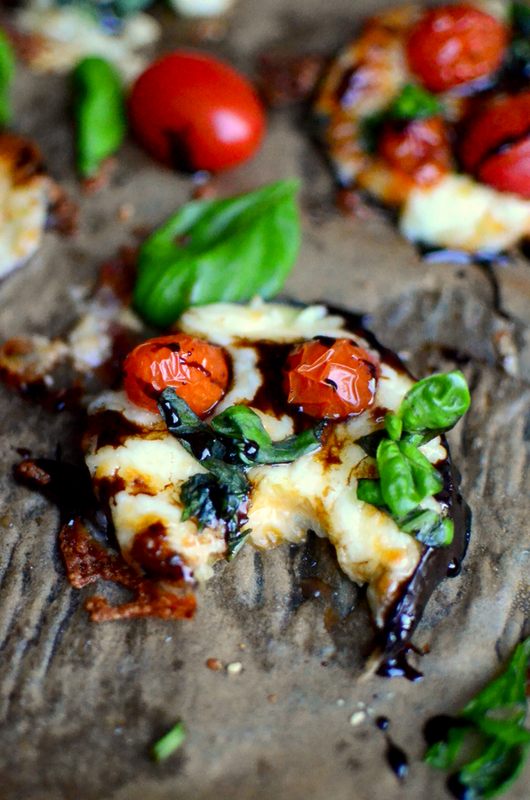 Drizzle the pizzas with the balsamic reduction and chopped fresh basil.